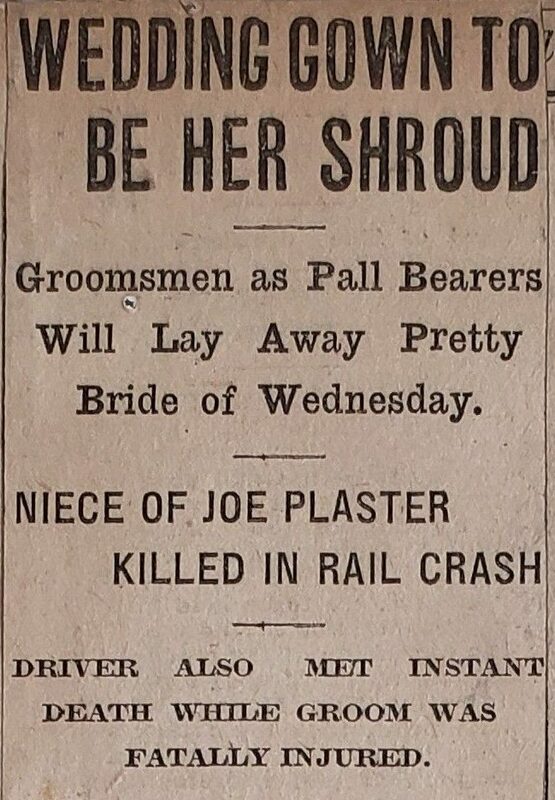 The headline read “Wedding Gown To Be Her Shroud.” The newspaper article was about a horrible tragedy, that took place just four days after the wedding of my husband, Bob’s 6th cousin 3 times removed, Ruth Schulenberg to Wilberd Youngman. 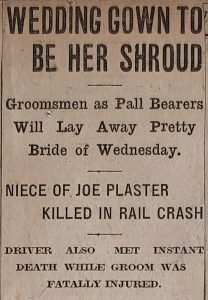 The wedding took place on November 26, 1913, and was a large social affair for the smaller town of Tolono, Illinois, population of about 700, at the time. 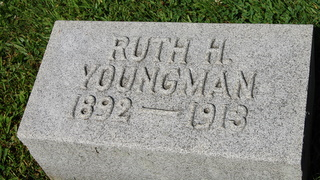 Ruth Schulenberg, was the daughter of Mr and Mrs Henry Schulenberg, and was a graduate of Saint Mary’s of the Wood where she was a member of a prominent sorority. 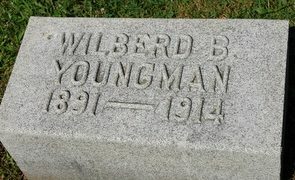 Wilberd Youngman employed as a draughsman by the Burr Company of Champaign, Illinois. The wedding took place at Saint Patrick’s Catholic Church in Tolono. After their wedding, the young couple was on their honeymoon, in Kokomo, Indiana, where they had attended church at the Kokomo Catholic Church. Following the church service, they were on their way to a big wedding dinner in their honor at the country residence of a neighbor of Youngman’s cousin, Edward Grishaw, who was transporting the couple in a closed carriage. As the carriage began its crossing of the tracks of the Lake Erie and Western Railway, Grishaw failed for look for trains, and pulled out in front of the Lake Erie train going full speed. The train ripped through the car, and by the time the train could stop and the crew reached the car’s occupants, Ruth Schulenberg and Edward Grishaw were dead. 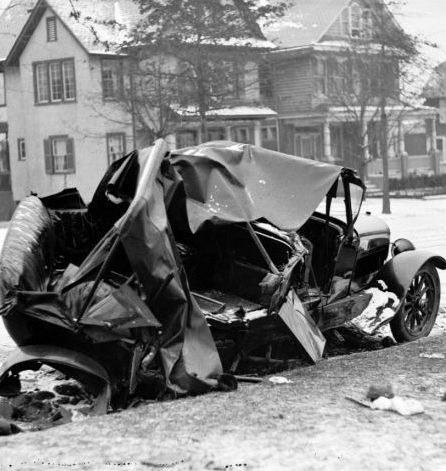 Wilberd Youngman was critically injured, and not expected to live. Amazingly, Wilberd Youngman did live…for eleven months. Youngman was taken to a hospital in Chicago, but his prognosis was grim. People just don’t come back from being hit by a train that ripped their car apart, and yet he was still alive, and actually recovering from his injuries…the visible injuries anyway. Youngman had lost so much that November day, and he was struggling to move forward. Ruth Schulenberg had been his soulmate, and his very best friend. She was the love of his life, and he knew there could never be another woman for him. Wilberd Youngman was not a man who would commit suicide, but he also could not recover from this deepest injury…the one that broke his heart. Slowly, over the eleven months that followed the saddest day of his life, Wilberd Youngman dwindled away. it wasn’t a refusal of food and water, but rather a refusal to go on without his precious Ruth. Finally, on October 24, 1914, just short of 11 months after that awful day…November 30, 1913, Wilberd Youngman could no longer go on living, and so, with his parents by his side, he simply passed away. The final cause of death was listed as a broken heart. That, to me was the saddest cause of death I had ever heard. Because of the loss of his wife, Wilberd simply had no desire to live either. He tried to recover…physically, but his heart was no longer in it, and he finally just gave up and quit trying. The Honeymoon Tragedy had finally claimed it’s last victim.